I have gone down the rabbit hole that is abstracting away a working game engine in OpenGL and C++. Before reaching the other side I'd like to ask about my current design, which is - the more I look at it - eventually in need of a major revision. I have separated windows, input and frame buffers from the concerns, but render operations are becoming a problem. 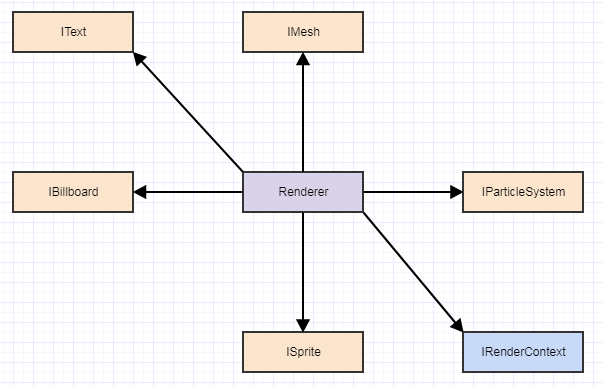 Currently all types of renderable objects, including frame buffers inherit from a common class: Renderable which has a shader program and a vertex array object. Next in the hierarchy is an Entity (yeah, I'd use better naming..), which has a model matrix, world coordinates, uniforms and associated functions with it. After that are the specific types of objects. Namely Dummy and Model. They deal with the actual buffers and data. For this example I will focus on Model. It shall load model data from a file, create buffers and draw the model on command. I planned to use a buffer for each attribute and process meshes separately, drawing with index buffers. I have also separated the concept of a buffer away from the renderable. I use a class for an index buffer and a vertex buffer (or interleaved buffer). The buffer manages data and e.g. binds GL buffers and deals with vertex array pointers and so on. This all was fine until I asked this question about VAO and VBO granularity on GameDev. Since then more doubts have arisen. Is using separate classes for buffers a common design pattern? What should be done to accommodate for textures, animations and such in the future? It seems that particularly when introducing the need of combining multiple meshes and their multiple attributes into a single buffer my design becomes a bit complicated since a buffer needs to know about a VAO and a model needs to provide the buffers with information. I've had bad experiences with too much abstracted rendering in the past. OpenGL is still very procedural at it's core, and the whole state management is very difficult to debug and extend if you apply a nice modern OO filter and make lots of small objects. In addition, writing optimized rendering code often forces you to take a global view because the different steps to render a frame and even just the content management/preloading don't map nicely to the approaches used in other parts of an engine. Therefore, I would separate the functionalities into layers as well as possible, so you can live in a 'looser' OO world with longer methods that deal with OpenGL state, and a nice clean world where you can work in a more abstracted, nice OO context. There's an link to DDD here, with seperate domains designed according to the needs of the domain. If I can try to read between some lines of what you said and try to deduce where you're trying to move with the design, I believe I ventured down similar rabbit holes and came out cursing with more gray hairs. In my particular case I wanted to abstract the rendering capabilities of all these rendering backends (OpenGL, OpenGL ES, DirectX, consoles, etc) in one abstract rendering interface to rule them all, like IRenderer, with the hope of minimizing porting grief by simply swapping one renderer subtype with another (ex: RendererGl with RendererDx). That's a bit different and probably more ambitious than what you are doing but I suspect there is a common theme to our design headaches. 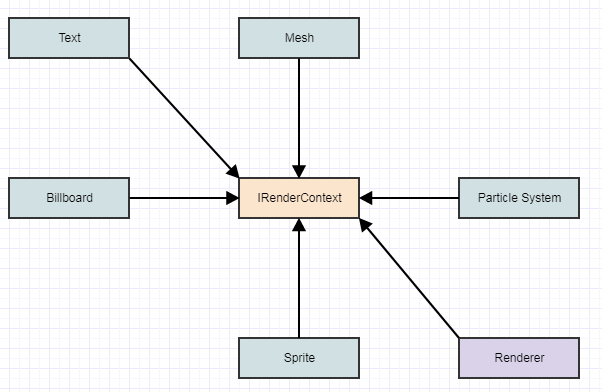 What was fundamentally so difficult to design with that route beyond the different rendering capabilities between all these backends and the difficulty of trying to design a uniform abstraction for all of them was how I was trying to make the renderer oblivious about the rest of the game engine and world. I was trying to decouple the renderer away from everything else and have the game engine have knowledge of how to use the rendering interface instead of having the renderer have knowledge about the engine. // vertex buffers and textures. And it was completely oblivious of higher-level abstract concepts in the engine like particle systems, models, bones, materials, lights, etc. Now I did still decouple the game logic from rendering code by injecting and associating renderable/rendering components to them, but fundamentally I was trying to make the renderer oblivious of the game world/scene. And that does mean I have this epic implementation of that function to render scenes (though decomposed into various smaller functions and medium-sized objects), and it does mean my renderers cannot possibly be made to work anymore for any engine other than my engine. Each concrete renderer has to know how about the abstraction of my specific engine's particle system, for example, and how to render it is up to the concrete renderer to use whatever low-level mechanisms it needs to do so. If you do it that way, then you can be as abstract as you want with the rest of the game engine and just think in terms of high-level logic without wrestling with the most effective to render the data and store and create and manage buffers and bind shaders and textures and so forth. That's all handled within the renderer itself. For things like models which are loaded from a file, the renderer might encounter an abstract model in the scene which isn't loaded, load the file, then externally associate a VBO to that model to be used for subsequent rendering. All the gory details of rendering are inside the concrete renderer. And that's still not easy to implement the renderer (it does help if you can generally attach data, like a component, to any entity that already exists, like a VBO component), but it was way simpler than what I was doing before as far as getting designs correct (the implementation was still hard) and I stopped having to fight with my own designs and interfaces trying to headbutt them into shape. These kinds of concerns you listed become rather moot in that case (in the sense of not tempting you to change your central designs) because you'll have all the breathing room you need in a particular renderer's implementation to get knee-deep in the specifics and peculiarities of OpenGL or any other backend to render the abstract objects/entities that make up your game world in an efficient way. Now the dependencies aren't flowing to B and you have all the breathing you need to change it without changing any central designs (a "central design" would be something lots of things depend upon which is extremely costly and difficult to change). Basically don't make things that are so hard to get right difficult to change. As straightforward as that seems, I think it's somewhat humanly counter-intuitive because I don't think most of us instinctively tend to abstract and flow dependencies in the direction of what's easiest to design correctly. It tends to be more intuitive to create abstractions in a way that yield the smallest implementations behind each abstraction and direct the dependencies that way instead of directing the dependencies away from what's most difficult to design correctly. Yet smaller implementations be damned if the designs on top constantly tempt us to reconsider them. Not the answer you're looking for? Browse other questions tagged design object-oriented c++ abstraction opengl or ask your own question. How to decide if object should request or receive data? What would be a good way to abstract OpenGL-Concepts in a game engine?